Slow Cooker Sausage and Cabbage is a easy crock pot recipe ready in 6 hours! 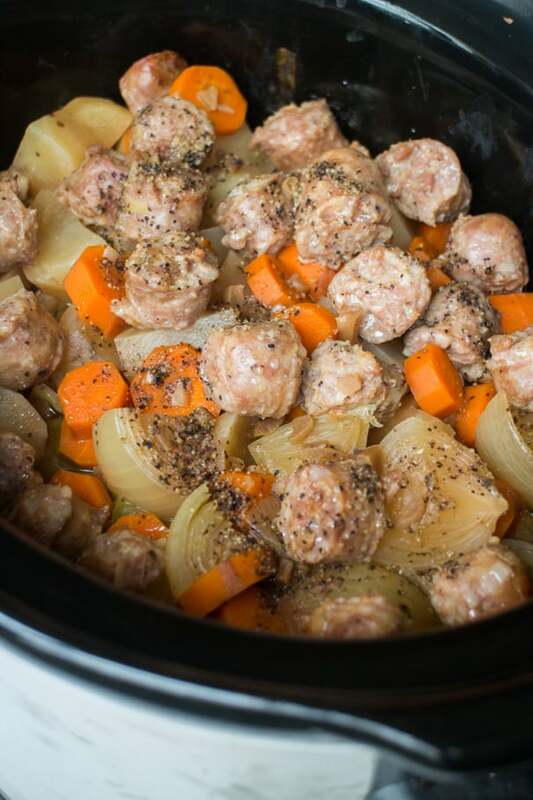 Add Sweet Italian Sausage links and vegetables (potatoes, cabbage, carrots and onion!) into your slow cooker for a delicious comfort meal! It’s Fall! It’s really fall! The leaves are changing, I need to wear a jacket in the morning, I prefer my coffee hot now. What else does Fall mean? Time to bring out the crockpot for my family’s favorite comfort meals! 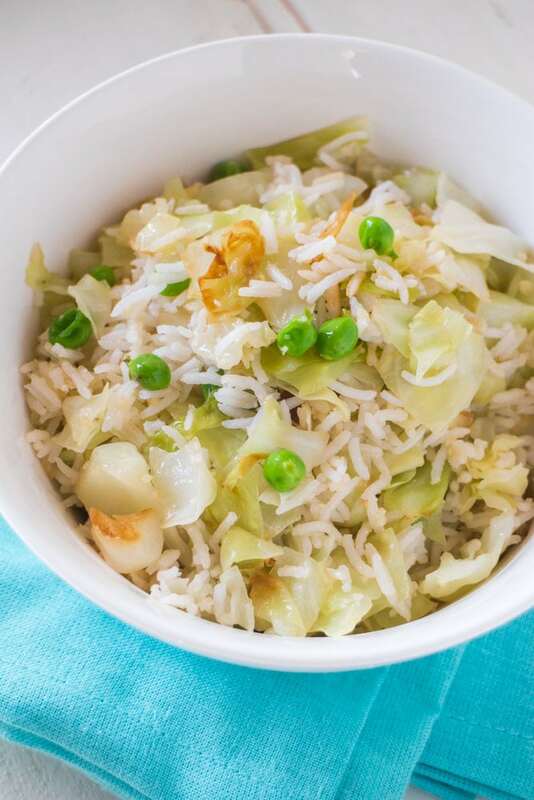 You guys have been telling me that I need to share more of my slow cooker recipes, since you’ve enjoyed my Cabbage and Kielbasa and Cabbage Roll Casserole. 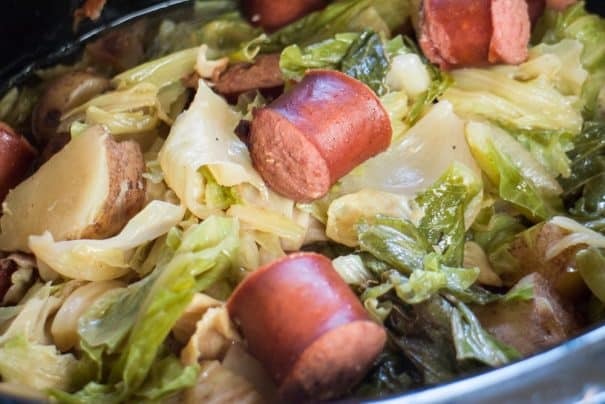 So here I am – now it’s time to share Slow Cooker Sausage and Cabbage! I love this recipe becase of the ingredients and the directions. The ingredients are basic, you might have everything in your kitchen already! 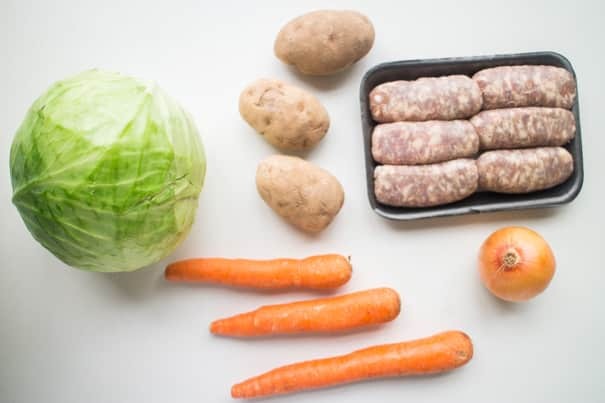 The stars of the show are Sweet Italian Sausage, cabbage, potatoes, carrots and a onion. Close your eyes. Imagine the smell of your kitchen while this cooks. It’s going to smell SO GOOD! Whenever I make this, my husband can smell it in our hallway as soon as he steps off the elevator. He gets a little strut in his step because he knows it’s going to be a good dinner. Hey Chelsey, you sure can! Enjoy the casserole! 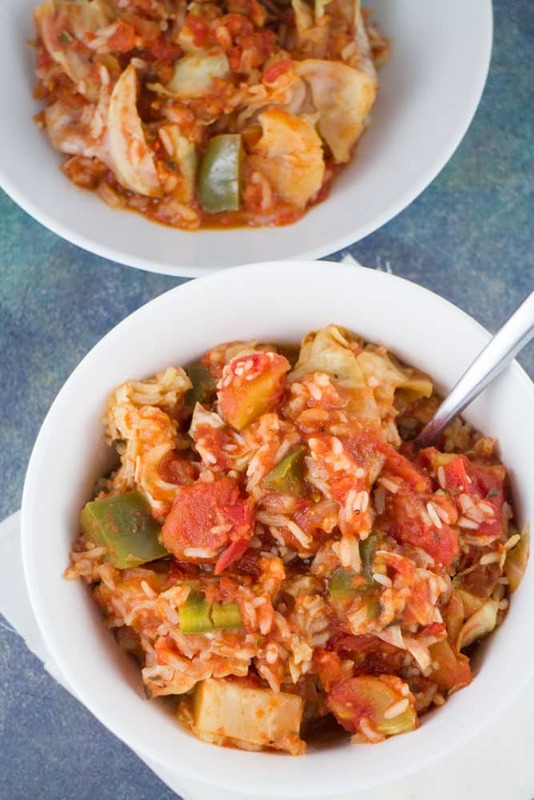 EASY, SLOW COOKER Cabbage Roll Casserole! This easy recipe is made in the crockpot and ready in 4 hours! 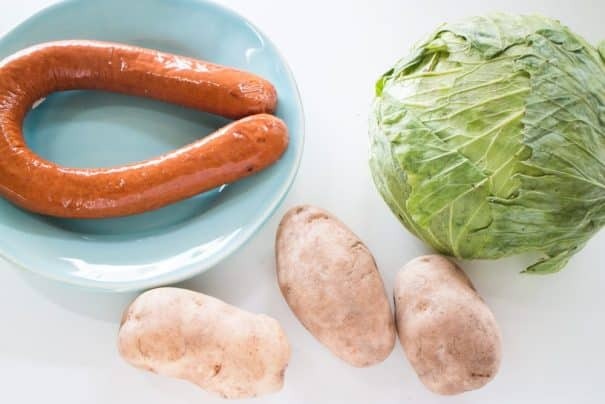 This is a Polish family recipe called Halupkie! Halupkie (aka Cabbage Rolls) were a big deal in my house. My Mother is Polish, so the recipe was passed down from generation to generation and ended up being one of my favorite meals she would make. Just like my Stuffed Pepper Casserole, this is another one of Mom’s famous recipes that my family loves! 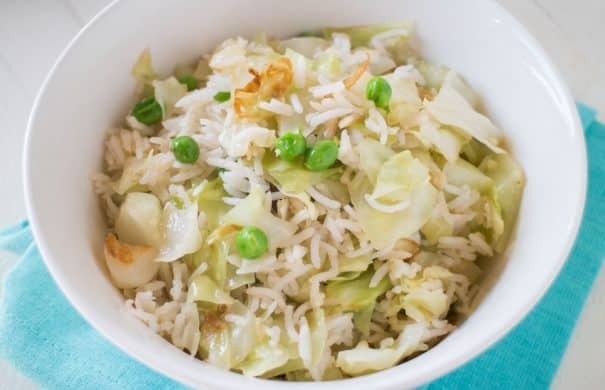 What recipe can I make with cabbage? She would add ground beef, rice and tomato sauce into a big piece of cabbage, roll it up, throw it in the fridge overnight to sit and then we would have them for Sunday dinner. Just the smell of cabbage takes me back to my childhood! 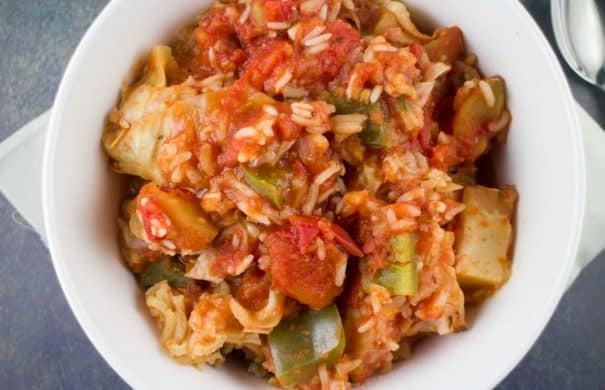 This Cabbage Roll Casserole is a direct spin off my Mother’s Halupkies recipe, but we’re making this in casserole form in the slow cooker. 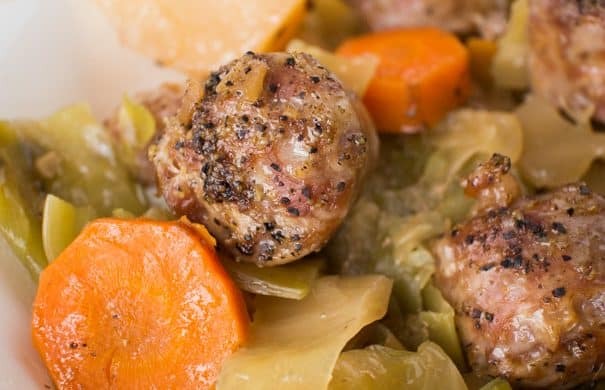 This is a big bowl of comfort food, just like my Slow Cooker Cabbage and Sausage! 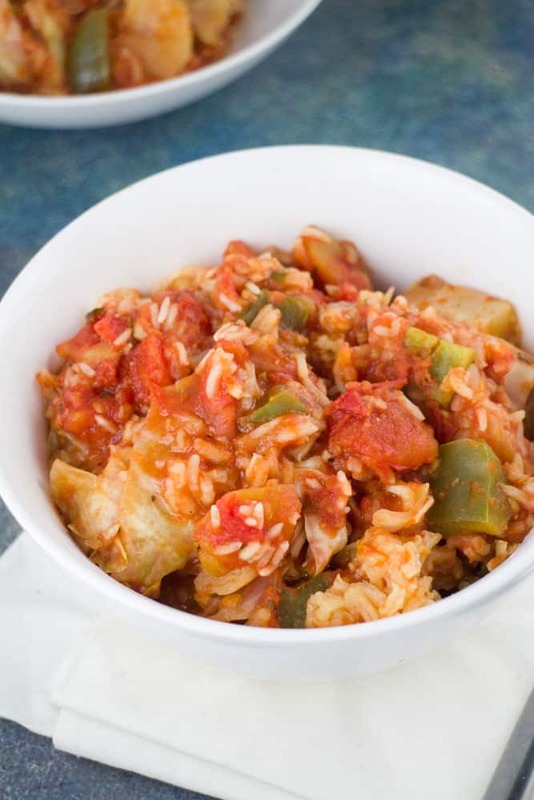 A nice warm bowl of cabbage roll casserole is the perfect dinner for a cold Winter night. Even better is that this recipe only takes 4 hours in the slow cooker – so it’ll be ready before you know it! 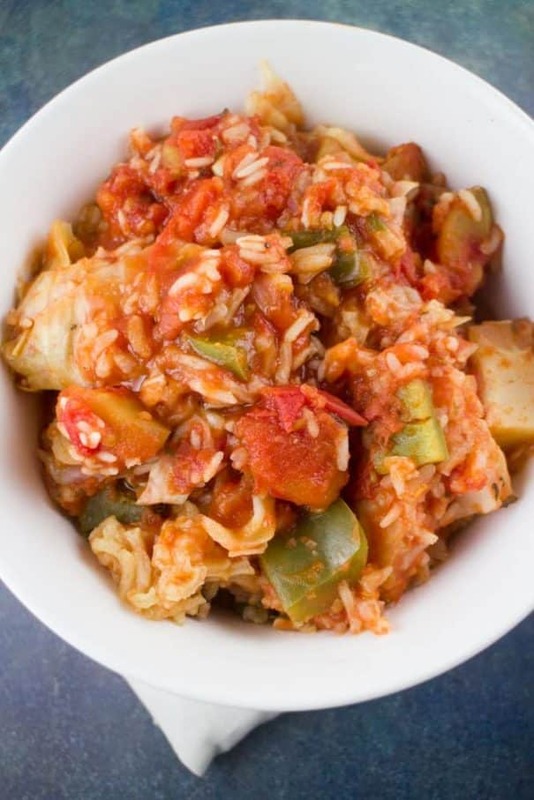 Enjoy this Slow Cooker Cabbage Roll Casserole! Looking for more recipes? Try my Kielbasa and Cabbage Slow Cooker and Stuffed Pepper Casserole meal next week! Looking for more pepper recipes? Try my BBQ Slow Cooker Chicken Thighs with peppers! 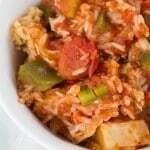 SLOW COOKER Cabbage Roll Casserole! This easy recipe is made in the crockpot and ready in 4 hours! This is a Polish family recipe called Halupkie! 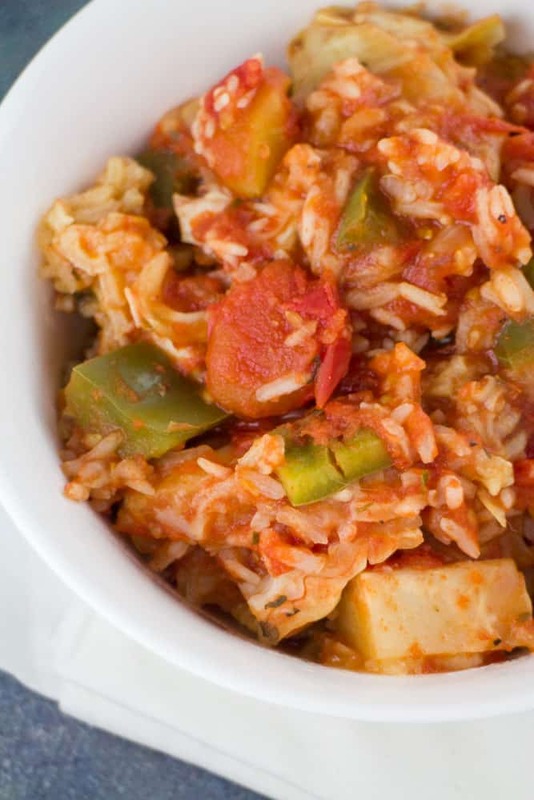 Add all ingredients except white rice in slow cooker. Stir good to combine. Cook on high for 1 hour. Add rice, stir, and cook on high for 3 more hours. Serve in bowls. 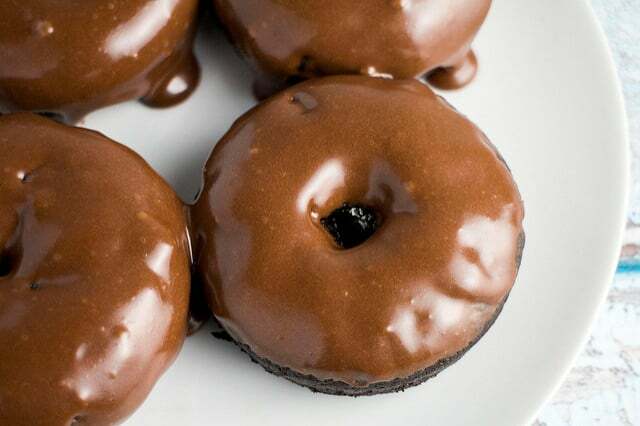 Hey Sandra, thanks for commenting - I'm so happy you like this recipe! 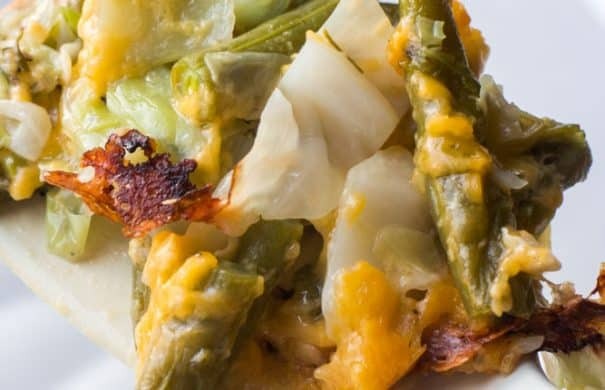 NO PASTA Macaroni and Cheese made with Green Beans, Cabbage and Cheese! 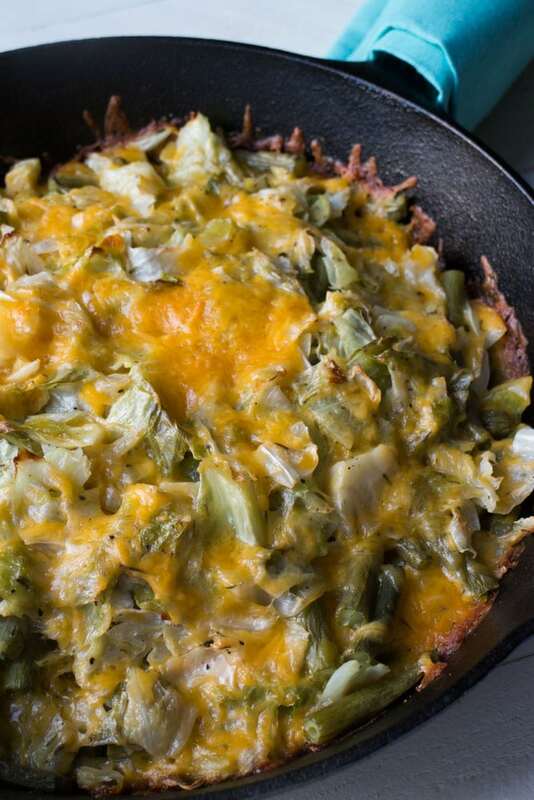 This easy baked casserole is simple to make and uses fresh vegetables instead of pasta. This homemade recipe is much more healthy than the usual macaroni and cheese dish! 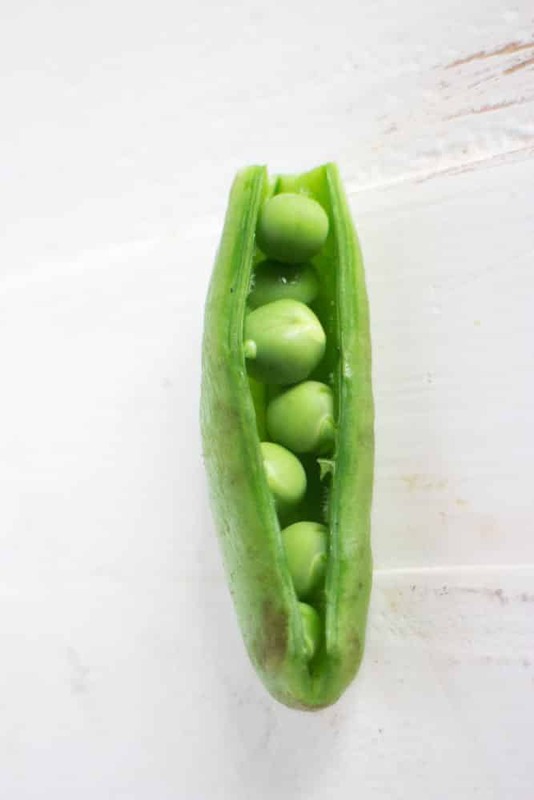 With pounds of green beans and cabbage to be picked in the garden I have been trying to come up with new ways to eat our veggies. For dinner one night I was craving macaroni and cheese but wanted to use our vegetables so this unique macaroni and cheese but without the pasta casserole dish was created! This would make a great new casserole dish for the holidays, as well as a everyday dinner when you have lots of green beans and cabbage. 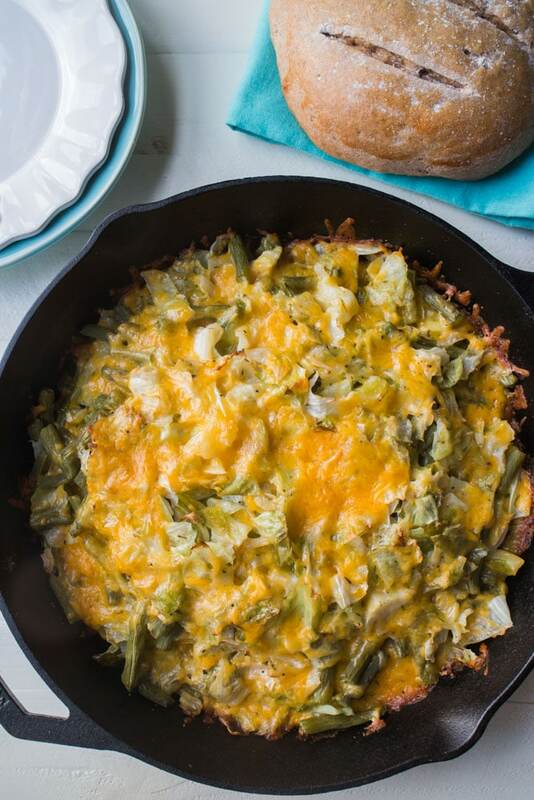 We are big fans of this dish in our house and I hope you will become one too!